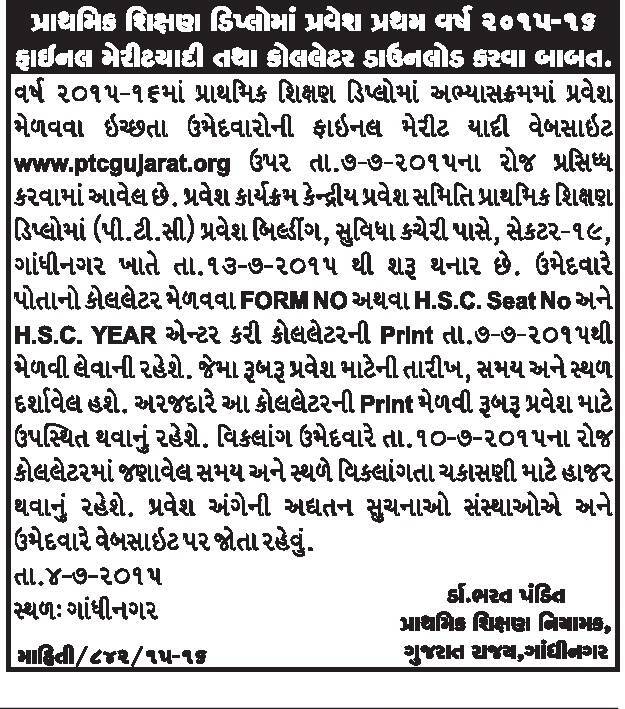 Gujarat PTC 2015 Final Merit List and Call Letter will be published online on official website www.ptcgujarat.org on today i.e. 07 July 2015. Candidates can download their D.el.ed PTC Call Letter by entering form number or hsc seat number and hsc year. Diploma in primary education which is known as a PTC. Education department is published notification in various news paper for D.el.ed Final Merit List and Call Letter. As per notification admission process will be started at Gandhinagar in Diploma admission building from 13-07-2015. Find “Final Merit List & Call Letter’ Link and Open it.